I've mentioned before that we're big reading fans, and love to take our older two granddaughters to the library. They're finally getting used to the idea that you don't buy books at the library; you borrow them. The oldest has started on The Mouse and The Motorcycle series, and she's just loving it. 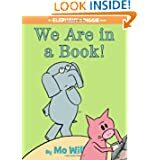 The 4-year-old is a fan of Mo Willems and his Pig and Elephant books. I have to admit, I think they're just hilarious too. Here's a link to Mo's Pigeon Presents Web site, with links to some of the best books. We've got "Don't Let the Pigeon Drive the Schoolbus" on hold at the library now, and we can't wait to read it. If you and your grandkids don't use the library yet, I highly recommend it, and the big secret to really enjoying it is the hold system. Our local library has a good Web site that lets us search for books and put them on hold. We'll find the ones we're looking for, and just wait for them to become available. It's let us enjoy so many books that we never could have before. The 6-year-old mentioned last week that she'd like that new book by Dr. Seuss, "The Lorax." I actually remember this one from when I was a kid, so I explained to her that it wasn't new (she thought it was because of the movie coming out) but we put it on hold, and can't wait to read it this week. Love, love, love the library. You are lucky to have a library close by -- we really don't! But we are lucky to have 2 very good used bookstores that are close by and my granddaughter is a regular customer at both of them!